Joshlyn Weaver has always lived with a big secret. Ordinary kids spend their free time going to the movies, hanging out with friends, and searching on the internet. But for her, an evening at home usually means entering people's dreams. For many generations, her family has been part of a very powerful and very secretive society of dream walkers. Tasked with the responsibility of lowering the world's general anxiety—which only leads to war and strife in the waking world—their job has always been to stop nightmares before they go too far. By stopping nightmares while sleeping, they help to stop nightmares in real life. But when an ancient feud within the dream walker society resurfaces right when a seemingly unconnected series of very strange and very scary events start occurring during her dream walks, Josh finds herself in a race against time. The one true dream walker has never been known. Could she be the one? A book about a dreamwalker, definitely something different for me, and I will say that this one worked out for the most part. I was intrigued by this world that Alloway creates where Joshlyn must travel through people's dreams to help stop nightmares before they go too far. Readers are introduced to Joshlyn and right away can see that there is a secret history she is hiding that has completely affected the way she acts and works, it takes a lot of time to get to that, but there is so much more that kept me interested in the story other than her history. While Josh is dealing with her own personal problems, there is also many dangers laying in wait in the dream world, many people are ending up in comas as their nightmares begin to take over. Someone is threatening the dreamwalkers society and this is something that has been built up over decades. It takes some time to fully learn about the history of the dreamwalkers but you can see that there are some definite struggles, and where Alloway takes the story is interesting and I truly enjoyed the idea of these other worlds around us. The characters that Alloway has created are intriguing, Josh is a determined girl and is very focused. She knows what she needs to do and she goes for it (even if sometimes it may get her in trouble) though in training someone else, Josh goes more in depth with dreamwalker history and begins to see things she may not have seen before. What I really liked was how it is when Will comes along that Josh begins to see things differently, he changes her perspective on things and has her open up a little more. Will and Josh definitely have a complicated relationship throughout the story but the way they work together and begin to trust each other really works. I love the build up of their relationship and I believe that it makes sense, Josh is skeptical of Will in the beginning but she begins to see that he is just as determined as she is and he will help her with one of her biggest problems. 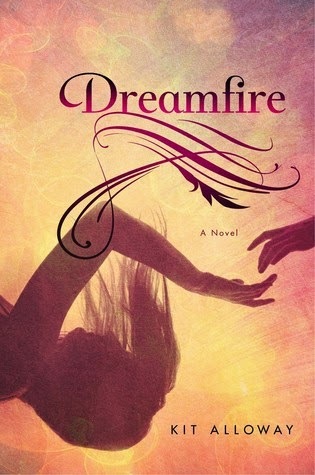 There were some great moments in this book that make you wonder about going between the dream world and the real world and if there really is a connection between the two. This book has a great taste of the magical with some creepy things happening and there is a bit of a political battle happening as well. I think Kit Alloway does a great job of incorporating a bit of everything into this book and I believe it will truly capture readers attention. This is a new one for me. I like the idea of a dream walker, so maybe I'll check this one out!